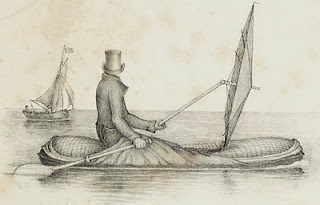 One of the lesser-known aspects of both the Franklin Expedition of 1845 and those who searched for it in the ensuing decade and a half was their use of the Halkett inflatable boat. Just today, I saw that the current featured article on the Wikipedia is a quite thorough and informative one about the Halkett Boat, and wanted to bring it to the attention of everyone here. The Halkett boat was the brain-child of Peter Halkett, a lieutenant in the Royal Navy. It was singular not only for its use of waterproofed rubberized cloth to make an easily portable inflatable boat, but for design features which rendered it especially valuable for use on expeditions where both land and water travel might be rendered necessary by conditions such as drifting ice, open leads in the water, or difficult portages. He even developed a version of the boat which could be disassembled and worn as clothing -- this is the type shown here. The sail doubled as an umbrella, and the oars as walking sticks; the boat itself could be disassembled and "worn" as waterproof clothing by two men. The design earned early praise from Sir John Richardson, who was likely the one who recommended it for Franklin's use. The design had only just been finalized, with Halkett having tested it on the Thames in 1844. The boat brought by Franklin was not, technically speaking, an officially-supplied item, but Halkett was eager to hear how it might perform in the Arctic, and Franklin was willing to give it a try. "[Aglooka had with him] a boat that had places on the sides that would hold wind ... with hollow places in the sides for wind (air) to hold it up when in the water ... There were sticks or holes for this boat, to keep it open (spread) when needed. This small boat was wrapped or rolled up in a bundle or pack, and carried on the shoulder of one of his men" (qtd. in Woodman, Unravelling the Franklin Mystery, p.309). Unfortunately, since John Rae's and James Anderson's parties were also equipped with Halkett boats, and Rae was also known as "Aglooka," it's very difficult to determine with certainty whether or not this Inuit account refers to Franklin's men. It's widely assumed that some of those who crossed Simpson's strait did so in a Halkett boat, though accounts of an overturned whaleboat on the mainland side suggest this is not the only viable explanation. But for more on this remarkable invention, I can only recommend the Wikipedia entry, which is far more detailed and better illustrated than anything I have seen in printed sources. This article (The Beaver, 1955) includes a photograph of Dr Rae's (then century old) Halkett boat. Considering the terrain facing them, the Franklin crews would probably have wanted to take this with them. (I would have, if it were not already damaged or lost in 1848). Such a boat would be useful in scouting ahead for optimal routes to be taken by any larger group. My understanding, and I have not gone through the primary sources so I may be wrong, is this. I think two Halkett boats were produced for the Franklin Expedition but only one was taken. The rejected boat may have never been loaded, or it may have been sent back from Disko Bay on the Baretto Junior. The Terror was heavily overloaded at Disko Bay and quite a number of things simply couldn't be carried. I believe this boat is the one which Rae subsequently used and which is now in the Museum at Stormnoway. I believe that boat has James Fitzjames' name on it - presumably it was originally delivered to him at Deptford. During the crossing of the Atlantic, Le Vesconte rigged the Erebus's Halkett boat and sailed it across to the Terror. William, did you ever go to the museum to check it out yourself? How did Rae come upon it? That is a small world link. My September itinery takes me to the Isle of Skye and possibly Ullapool so a Stornoway detour may not be completely out of the question. Coincidentally, I just read in Lambert's Gates of Hell that Halkett contributed twenty pounds toward the Joseph Rene Bellot pension that the British government established in 1853 (p.242). Small Arctic world indeed. No, I've not been but I would like to. I'm guessing there might be other interesting stuff there. I believe that the museum that is meant is the one at Stromness (Orkney), not Stornoway. I saw a Halkett boat in a display in the Stromness museum five years ago. If I remember correctly, it was Rae's - Stromness is Rae's home turf. I have no idea if that display is still up. That would make more sense Kenn. Thanks. "Sir George [Simpson, Governor of HBC] sent Rae an inflatable India rubber boat designed by a young naval lieutenant named Peter Alexander Halkett. The prototype, tested on the Thams near Westminster Bridge, included an umbrella sail that doubled as a heavy cloak and so was called a "cloak-boat". Rae would declare that "this useful and light little vessel ought to form part of the equipment of every expedition." "